Growing up never seems easy, and when you are Finn Easton and have lived your life as the epileptic boy, it's even harder. As a little boy, his mother was killed in a horrific accident and he was left with epilepsy. Over time, he let his illness define who he was. His father wrote a cult-classic novel, in which one of the characters is also named Finn. As a sixteen year old, Finn finds himself questioning where the fiction ends and his real life begins. During a college visit trip with his best friend Cade, the twp experience a life changing event signalling their passage to adulthood. It also brings the two families closer together. My enjoyment of this story grew as I progressed further into the book. Finn is transfixed by the passage of distance travelled by the earth. Instead of counting seconds, he counts miles. I felt this was odd, until I realized that this was a coping method. He was trying to hold control over some portion of his life since his epileptic episodes took that away. Once I became used to it, I found myself converting the distances to seconds and it made total sense. I felt that the language of the boys was totally consistent with their age. 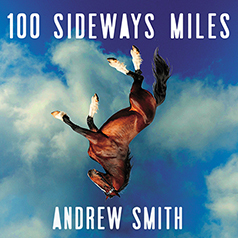 It's not vocabulary most adults would use, but then again, author Andrew Smith wrote this book was written for a teen audience. This book should be enjoyable by male and female readers alike. We learn a lot from Finn, mainly that you don't have to your illness, instead you can be a kid who happens to have an ailment. I listened to the unabridged audio book as read by Kirby Heyborne 6 hours 42 minutes. Cover image courtesy Tantor Media.